Mies Van Der Rohe often noted, when discussing design, that “Less is more.” By this he meant that simplicity and clarity lead to good design. What is true in architecture and design is true as well in pysankarstvo. 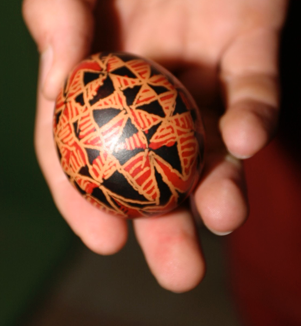 A well designed, simple pysanka with a few colors is often more pleasing aesthetically than one with excessive detail and a multiplicity of colors. 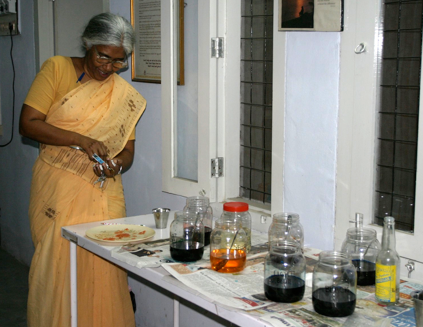 When teaching pysankarstvo, I like to keep the dyes to a reasonable number. When we write pysanky at my sister-in-law’s house, where most of the participants are seasoned pros, we put out every jar that she owns (the complete UGS series plus a few extra) and have few problems. When I teach classes, though, I try to keep the number of dyes much lower. You can create any sort of dye set you like for your classes, but you should keep in mind that the more choices there are, the more confusing things get, especially at first. 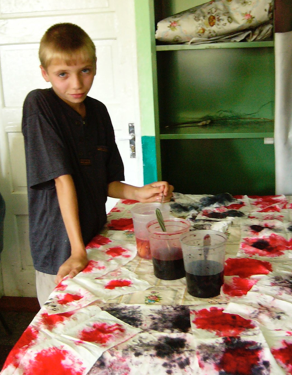 If you have a pattern you will be teaching, bring the dyes you will need for that particular pysanka. 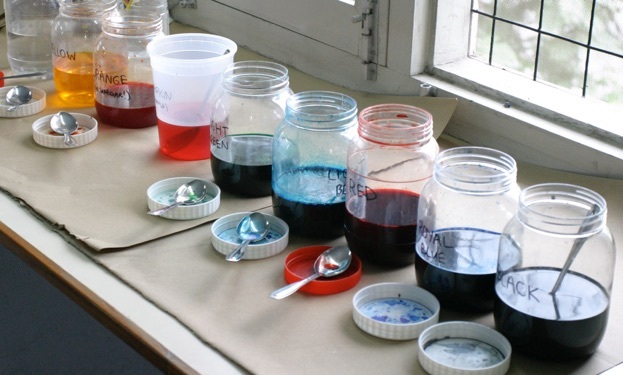 If not, take into consideration the skill level of your students, the space you have available, and whether you will have to schlep the dyes long distances. I also have two jars of Orange, one used as a rinse, and one as a dye. Below are a few of the dyes sets that I use. I generally use UGS (Ukrainian Gift Shop) dyes–they are the workhorses of the pysanka world, used by professional pysankary everywhere. I have used them for decades, and they are reliable and predictable. I use a mix of two of their reds (Red and Scarlet), aka “Red Mix,” for all my classes. These colors are adequate for making most traditional pysanky and diasporan pysanky. If you have a nice brown or dark red dye that you really like, this might be a worthwhile addition, as an alternate final dark color. If you are really short on time, Yellow, Red and Black will suffice. SET 2: ADVANCED BEGINNERS For a group that’s written pysanky before, I add Light Blue, Royal Blue and Dark Red to the basic set, as well as a jar of Orange Rinse. This sequence allows for more creativity, and for the ability to create blue-green spectrum pysanky. It also provides a choice of three different colors to use as the final color. Note that the Dark Red, when used over red or orange, usually provide a nice, deep mahogany color, a lovely rich red-brown. SET 3: BROWN EGGS On rare occasion I have had no option but to use brown eggs for writing pysanky–in some parts of the world brown eggs are the only type available. In this situation, even fewer dyes are needed: Red and Black, and perhaps another dark (final) color or two: Royal Blue, Dark Red, etc.